FLW … With Their Hands! GENEVA, NEW YORK – The Finger Lakes Workforce Investment Board Inc. (FLWIB) announced today that Workforce Development Institute (WDI) is July’s “Community Partner of the Month” recognizing their efforts in working collaboratively with Finger Lakes Workforce Investment Board to address workforce issues impacting the region. Lynn Freid and Bob Trouskie receiving the award on behalf of the Workforce Development Institute. The Workforce Development Institute (WDI) began in 2003 as a partner to the NYS AFL-CIO and Area Labor Federations to provide workforce training and education services to regional and local unions. Their role has since evolved and they now focus more broadly on the growth and retention of good jobs in New York State through a variety of mechanisms. Their work is often accomplished through partnerships and collaborations with businesses, unions, other non-profits, educational institutions, and government. WDI works regionally to identify targeted strategies that address workforce development opportunities and challenges. These strategies can include partnerships, training and/or funding. In the Finger Lakes Region WDI is a regular sponsor of “Finger Lakes Works with Their Hands” an annual career exploration event coordinated through the FLWIB that has allowed thousands of high-school students to experience careers in skilled trades and advanced manufacturing over the last ten years. 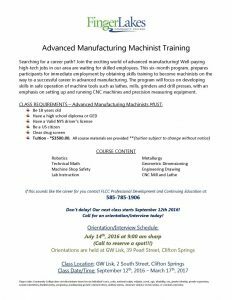 Additionally, WDI has provided scholarships for the Advanced Manufacturing Machinist Training program offered through Finger Lakes Community College at GW Lisk and ITT Gould’s Pumps. WDI also works directly with local businesses, like Rush Machinery, to assist the company with the development of an update to the company’s internal software package, which drives the machines used for production. WDI is also working with SSD Badge, LLC to upgrade of the company’s server while helping out with training costs so that the company can attain ISO certification. GUARDIAN INDUSTRIES OF GENEVA, NY!! 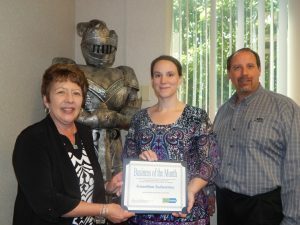 GENEVA, NEW YORK – The Finger Lakes Workforce Investment Board (FL WIB) announced today that Guardian Industries, located in Geneva, NY is June’s “Business of the Month” recognizing the company’s efforts to build strong community partnerships along with their continuing contributions to the local economy. Karen Springmeier (left), Executive Director for the FLWIB, Inc. presents the award to Rebecca Farrington (center) and Shawn Pollock, both are HR-Generalist’s at Guardian Industries in Geneva. Guardian Industries produces high performance glass for architectural, residential, interior, transportation and technical glass applications. Guardian’s glass is found in homes, offices and cars and in some of the world’s most iconic projects. Their energy-efficient, low-E-coated glass is designed to meet the toughest architectural and aesthetic challenges. Producing high performance glass takes a highly skilled workforce. To help find these workers Guardian accesses the services of Finger Lakes Works. Open Recruitments through FL WIB’s Career Centers and annual job fair events are just a couple of strategies Guardian has used to help them find qualified applicants. Additionally, Guardian uses pre-employment testing services known as Work Keys, administered through Finger Lakes Works, to help ensure the new employees have the right skills for Guardian’s positions. Guardian is also a member of FAME (Finger Lakes Advanced Manufacturing Enterprise) a regional industry group focused on building a world-class workforce here in the Finger Lakes. Spotlight On… FLCC Mechatronic Graduates!! 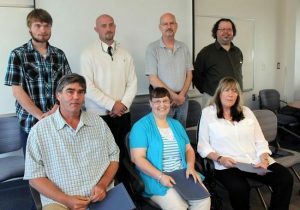 Nine students graduated from the Finger Lakes Community College mechatronic technology program and all had multiple job interviews before the class ended! Photo of the graduates taken by FLCC. Follow this link (https://www.mpnnow.com/news/20160529/flcc-graduates-nine-from-mechatronics-program) for more information! Congrats graduates and good luck in all you do!! MCGREGOR VINEYARD OF DUNDEE, NY!! 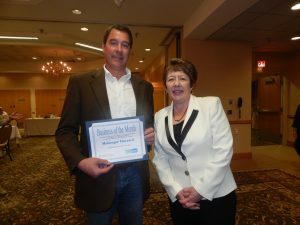 GENEVA, NEW YORK – The Finger Lakes Workforce Investment Board (FL WIB) announced today that McGregor Vineyard, located in Dundee, NY is May’s “Business of the Month” recognizing the company’s efforts to build strong community partnerships along with their continuing contributions to the local economy. Karen Springmeier (right), Executive Director of the FLWIB, presents the award to John McGregor of McGregor Vineyard. McGregor Vineyard is one of the oldest vinifera grape growers with the first vineyards planted in 1971. The winery was founded in 1980 by Bob and Marge McGregor who are considered true pioneers of vinifera wines in the Finger Lakes. John McGregor, son of Bob and Marge McGregor is the second generation running the vineyard and winery. A member of the FL WIB since 2014 John McGregor has been active on the board’s Youth Committee and has participated in various activities such as the Employer Panel discussion for high-school counselors focused on careers in the Agro-Tourism industry. Most recently John served on the planning committee that coordinated the first annual career exploration event in agriculture entitled “Building the Agricultural Intellect of Finger Lakes Youth” Career Day! The event took place in April and saw 200 local high school students from 13 local school districts. McGregor Vineyard also participated in the event with a booth talking about grape growing and wine making in the Finger Lakes. “We are fortunate to have a partner like John who actively participates in the development of the emerging workforce in our area” says Karen Springmeier, Executive Director, Finger Lakes WIB. Dr. Sam Samanta, Finger Lakes Community College professor of physics and founder of the Instrumentation and Control Technologies program at FLCC’s Victor Campus. 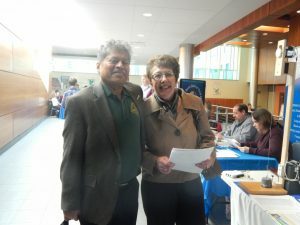 Dr. Sam Samanta with FLWIB’s Executive Director, Karen Springmeier, at our April 19th Finger Lakes Job Fair at FLCC. The below article from the Daily Messenger features Samanta and all of the great things he does for the industry and FLCC! SPRING HOPE DAIRY AND WILLOW BEND FARM! 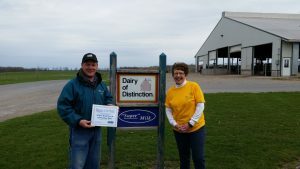 GENEVA, NEW YORK – The Finger Lakes Workforce Investment Board, Inc. (FL WIB) announced today that Spring Hope Dairy and Willow Bend Farm, LLC located in Clifton Springs, NY is April’s “Business of the Month” recognizing the company’s efforts to build strong community partnerships along with their continuing contributions to the local economy. Spring Hope Dairy produces high-quality milk for the Upstate Niagara Milk Co-op. They are committed to and care for their cows, land, employees and community. Founded in 1957 by George B. Mueller with just one cow, the farm now has about 3,000 cows. About 1,200 head are still at Mueller’s home dairy, along with 2,300 to 2,400 youngstock. They farm about 5,000 acres, most of which is used to grow forages. Karen Springmeier (right), Executive Director of the FLWIB, presents the award to John Mueller, Owner of Willow Bend Farms at the first annual “Building the Agricultural Intellect of Finger Lakes Youth” Career Exploration Event on April 25th. Spring Hope Dairy Co-Owner, John Mueller has been a member of the Finger Lakes Workforce Investment Board since October 2008 and currently serves as the board’s Vice Chair. In 2014 John became the Chair of the FLWIB Performance and Evaluation Committee. 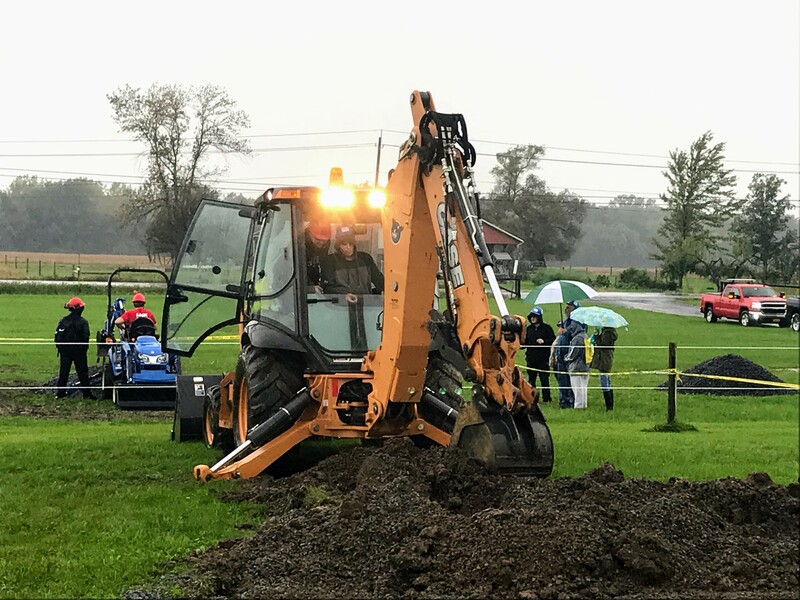 This year Spring Hope Dairy was one of the stops on the board’s first Agriculture Youth Career Exploration event entitled “Building the Agricultural Intellect of Finger Lakes Youth” held earlier this month. The event is intended for area high school students and includes visits to Cornell Cooperative Extension and the Finger Lakes Community College’s Viticulture Center. 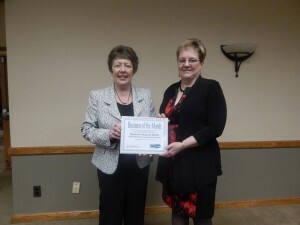 The Business of the Month Certificate was presented during this year’s event. “John recognizes the value of developing the emerging workforce and works closely with the Finger Lakes Workforce Investment Board to achieve a high standard of workforce development for the area. He also provided great insight and leadership in developing the ag career event,” says Karen Springmeier, Executive Director. APRIL 19TH – THE FLX JOB FAIR!!! This event brings a TON of local businesses in the Finger Lakes and HUNDREDS of area job seekers!! We offer not only a job fair, but workshops as well! This year we will have a workshop from 11:30-12:15 for job seekers about networking at a job fair and promoting yourself and your skills. From 12:30-1:15 job seekers can learn all of the insider secrets about business recruiting and what employers look for in an employee from Bill Kaminski, FL Times columnist and a brilliant management training and workforce consultant. Employers from all industries are looking to hire! Come prepared and ready to interview. We are offering FREE professional head-shots for your online profiles or to put with your resume. Dress for success and have an opportunity to win a prize!!! NEWARK-WAYNE COMMUNITY HOSPITAL (an affiliate of Rochester Regional Health System) in Newark, NY!! 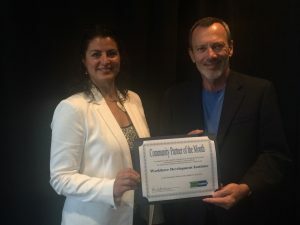 GENEVA, NEW YORK – The Finger Lakes Workforce Investment Board (FLWIB) announced today that Newark-Wayne Community Hospital (NWCH), an affiliate of Rochester Regional Health, is March’s “Business of the Month” recognizing the company’s efforts in building strong community partnerships while contributing to the local economy. Newark-Wayne Community Hospital is a 120-bed community hospital that is located in the Finger Lakes region in Wayne County, NY. NWCH offers a full range of medical services and is committed to providing unsurpassed quality and exceptional service for its patients and their families. Karen Springmeier (left), Executive Director of the FLWIB, presents the award to Michele Fortune, HR Manager for Rochester Regional Health- Eastern Region. To assist in developing a talented workforce NWCH has accessed the recruiting services through Finger Lakes Works Business Services. Along with posting openings with the New York State Department of labor’s Job Bank, the agency has taken advantage of open recruitments at the career center in Lyons. Additionally, they have participated in numerous job fairs and career expos. Michelle Fortune, Manager, HR Business Partner Operations with Rochester Regional Health has been a FLWIB board member since 2012 and a member of the Healthcare Alliance of the Finger Lakes since 2013. The Healthcare Alliance of the Finger Lakes, part of the FLWIB, is a consortium of regional healthcare providers whose focus is the development and retention of a high quality workforce. 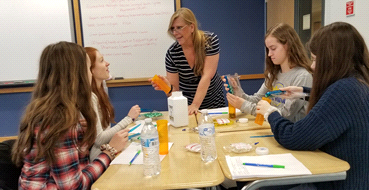 Through the Healthcare Alliance, NWCH has been an annual sponsor “Serving Community Healthcare in the Finger Lakes”, an annual career exploration event serving hundreds of high school students in the area each spring. For the past two years Bill Kaminski has written the column: “Get-a-Job” for the Finger Lakes Times. 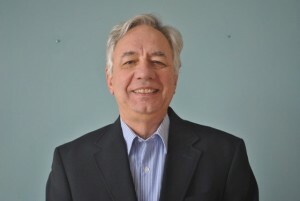 Bill has worked in the recruiting profession with Occidental Petroleum, Cornell University, The Guthrie Clinic, NY Chiropractic College and Seneca Cayuga ARC. He is an adjunct faculty member for Keuka College and owns a management training consulting business, Stone Associates Training. As a consultant Bill teaches managers how to recruit, hire and retain great employees. Thank you for considering a donation to the Finger Lakes Workforce Investment Board, Inc.! Your generous, tax-deductible gift will support our mission to improve the economic well-being of youth, job seekers and employers in the region by aligning human potential with opportunities in the workplace.